What is the Perfect Rocking Chair? There is an ideal in my mind of the perfect rocking chair - not just any rocking chair, though even the concept of a rocking chair is almost heaven by itself. To me, a rocking chair is the essence of relaxation - a place to take the weight off your back and take in the view. A place to read a great book or to visit with friends. To me, just the sight of a rocking chair gives me a magnetic attraction to that spot - I want to sit there, unwind, and take in life. But "perfect" is a big word - and a connoisseur knows you can't throw a word like "perfect" around lightly. And I am a connoisseur. I realize that there is a certain degree of personal opinion when it comes to concepts like "comfort" and "beauty", which are more art than science. However, I can also tell you that there are certain features of comfort, such as contoured seats and backs, that pretty much everyone agrees on. Beauty is less widely agreed on, so I don't focus much about beauty in these pages. But other important attributes of rocking chairs, like weather resistance, durability, and certain structural features that bear on those aspects, are more science than art. While you can have another opinion of weather resistance or durability, the facts cannot be denied and don't vary by user (although certainly you could have the opinion that durability doesn't matter because your rocker is going to sit in a guest bedroom where no one will ever sit in it...). So when I see a rocking chair, I take note, take a seat, and I often take a picture. 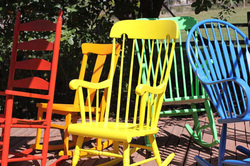 I'm going to share my perspectives on what makes a rocking chair truly wonderful. I hope you find these pages helpful in your quest to find the perfect rocking chair for your house or porch. I enjoy writing it! Please note - most of my notes and comparisons are on "The Perfect Rocking Chair Blog" which you can access by clicking on the tab at the top right of the screen. I hope you enjoy your time here on the site, and invite you to comment on any of the posts! I'll try to answer them as quickly as I can.